I admit, I did start skimming in this book, for no other reason than my disinterest in certain story lines. It’s nothing new in a book where I’ve become so infatuated with a character. If I’m not with that character, I tend to grow bored easily. Shame, really, because I definitely warmed up to Arista in this book as much Hadrium, whom I was already fond of. She was—as are all the female characters—strong and realistic. And while in Modina’s POV there are brave, interesting characters, I just couldn’t get completely involved in the story. I think it goes back to my lack of patience for books that aren’t more quest driven (I need more action). 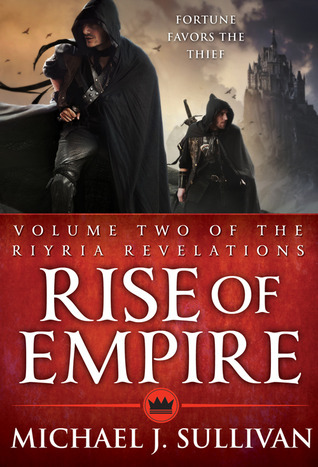 While Rise of Empire does have plenty of adventures, those sections with Modina just really seemed to drag for me. And, honestly, I wanted to get back to Royce’s story. Have I mentioned how much I love Royce? Seriously do. Much to my surprise, I did not latch on to Hadrian any further. I still think he’s great—amazing, really—but nothing changed from book one. That’s not bad or good, just something that I didn’t see coming… or rather, not coming.